Whether you’re thinking of starting a new restaurant business or refurbishing your current one, getting the flooring right is crucial. A poor choice of flooring will be vulnerable to damage, be prohibitively expensive to install or maintain, may discourage diners, and might invite a visit from the health and safety inspectors. In short, your choice of flooring will contribute to the success or failure of your restaurant business. For each of these areas, there are 3 different factors that need to be considered when it comes to flooring: durability, ease of cleaning, and style. Whether your restaurant offers fine dining, fast food, or something in between - or whether its urban sophistication, rustic rural or a sandy seaside joint – these 3 areas and factors remain the key loci of focus. In this article we’ll examine the durability and ease of cleaning. In our next article we’ll explore style. Restaurant flooring suffers a constant barrage of foot traffic, relentless shifting of furniture and equipment, persistent spilling of food and drink, as well as occasional leaks. But it’s important the floor is immaculate and squeaky-clean to lure in clients and make the all-important first impression. Hence restaurant flooring, whether in the dining, kitchen or bathroom area, demands absolute durability, ease of cleaning, stain resistance, and minimal porosity. Porcelain tiles are the very best solution for dining area floors, as they’re exceptionally hard and durable, scratch resistant, moisture resistant, chip resistant, and fade resistant. Indeed, porcelain tiles are almost indestructible. Their exceptionally low porosity means that a simple wipe with a cloth or sponge will quickly remove any spillage. A good mop at close of day will prevent the build-up of dirt and grime, and effortlessly retain the elegance of the flooring. When it comes to busy commercial kitchens, porcelain tiles are also recommended by flooring experts for their combination of strength, durability, low absorption, stain resistance, and ease of cleaning. Their exceptional durability will withstand the dragging of heavy kitchen equipment. Their low porosity means they’ll not absorb spills that might leave permanent staining on other materials. Maintenance is simple as porcelain does not require any sealing for water resistance. It’s no exaggeration to declare that porcelain is one of the very best flooring materials to withstand the onslaught of the high-stress commercial kitchen environment. Some restaurateurs opt for ceramic tiles for flooring. However such tiles present a conundrum for the kitchen. Unglazed ceramic tiles are too porous for a commercial setting, whereas if you opt for glazed tiles, their lower slip-resistance could put the safety of staff and customers in jeopardy. In addition, ceramic tiles are less durable than porcelain tiles. So in terms of practicalities, porcelain tiles with high slip resistance are a far better bet for commercial kitchens. Commercial bathrooms are subjected not just to heavy footfall, but also to all sorts of ‘spills’ that people are more careful not to make in their own homes. Hence once again the extreme low porosity and ease of cleaning of porcelain makes it the ideal tile for the commercial bathroom. As commercial bathrooms are not typical wet areas, they do not require a non-slip surface; however, it’s recommended that such tiles have low-slip properties. Commercial bathroom walls are often decorated with tiles to match the flooring. Glazed ceramic tiles are optimal in this case as they are lighter than their porcelain cousins, yet still offer the necessary moisture resistance. Linoleum and vinyl tends to scuff and split under heavy traffic and requires regular replacing, although modern luxury vinyl tile does meet the requisite durability requirement. Natural stone such as marble, granite and slate can convey a sense of opulence in a dining area. However in relation to stone-effect porcelain tiles, natural stone is expensive, extremely demanding and time consuming to install, far harder to clean and maintain, requires polishing, and is more vulnerable to stains, chips, and scratches. Furthermore, as all natural stones are porous, their use in a commercial kitchen or even dining environment requires the periodic application of a sealant surface layer. Natural Wood flooring, although popular in many restaurants for evoking a rustic ambience, is far more vulnerable to the effects of everyday traffic. It is easily scratched and chipped, notoriously hard to clean, and highly absorbent of spills. Indeed should a fridge in the wine bar or a washing appliance in the kitchen leak out onto the floor, the wood will absorb enough water to ensure warping and expansion which will lead to buckling. This means only one thing – a new floor. Furthermore, it is prone to discolouring, and thus creating an unappealing scuffed-looking track, in the areas of most traffic – such as from kitchen to dining area, and dining area to bathrooms. To avoid this look the floor needs to be sanded back and refinished periodically. Wood effect porcelain tiles on the other hand will last for generations in practically any situation. 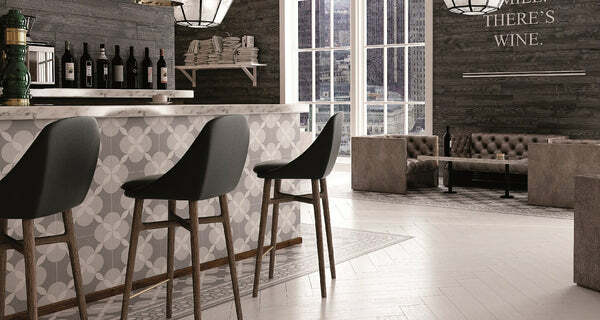 Indeed, it’s fast becoming the surface of choice for shops, restaurants, and even busy airports, as owners recognise the huge advantage that comes with installing durable ceramic or porcelain wood effect tiles. Laminate can be used as a 'wood-look' choice, but it is essentially a “photograph” of a real floor mounted on a durable backing board and can appear rather cheap – not the type of look most restauranteurs want to radiate. Although more resistant than natural wood, it demands careful maintenance. Once damaged it cannot be repaired, but requires costly replacement. If you’re looking for a flooring material that will cover all the practical necessities for a restaurant, then you should look no further than porcelain tiles. This is particularly so if you intend being in business for a considerable length of time. They offer excellent value for money, little maintenance, considerable ease of cleaning, and peerless durability. Porcelain tiles also offer an incredible number of options when it comes to the style you wish your restaurant to exude – and that is what we shall explore in the next article.